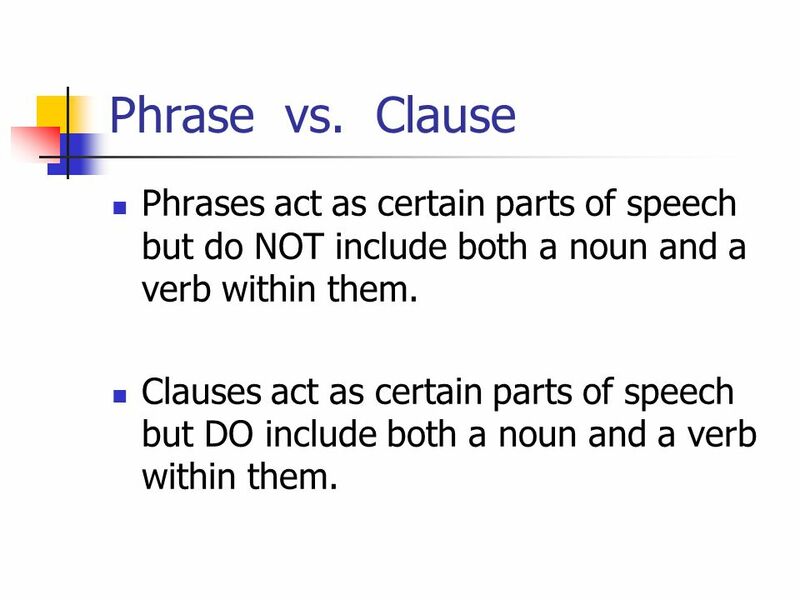 2 Phrase vs. 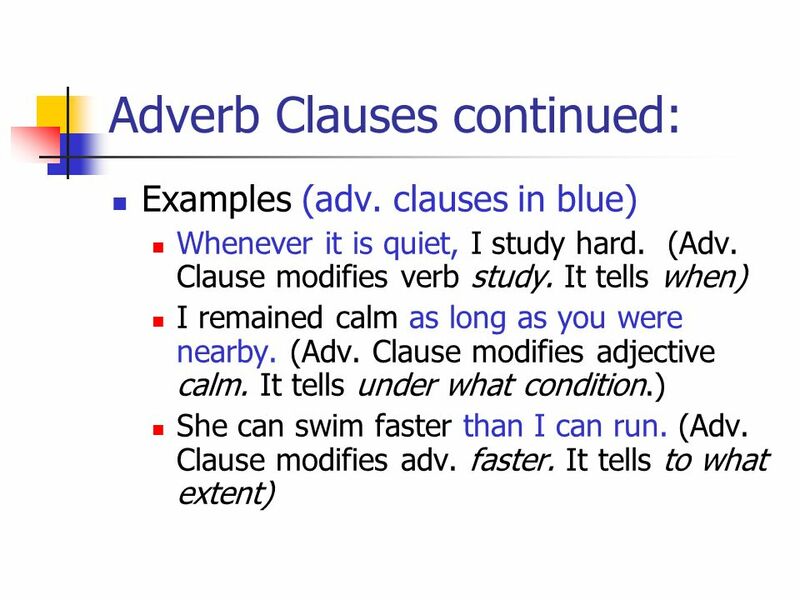 Clause Phrases act as certain parts of speech but do NOT include both a noun and a verb within them. 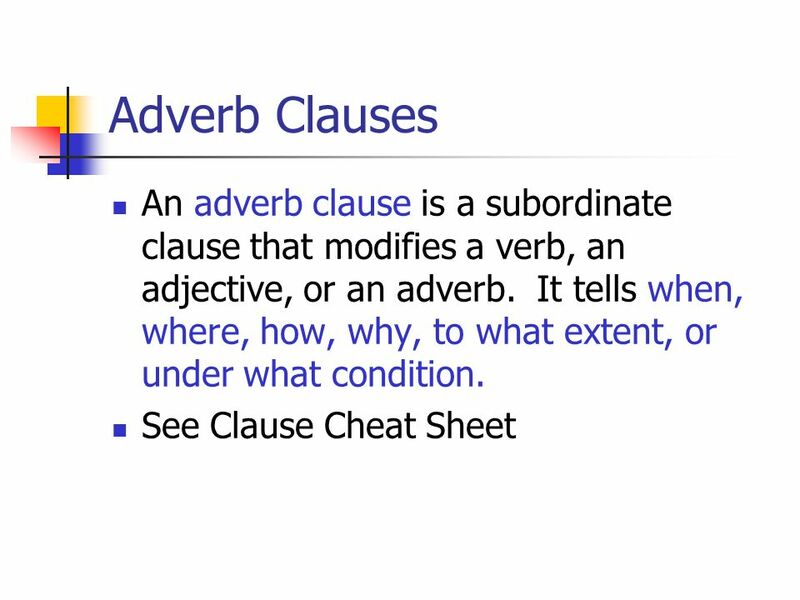 Clauses act as certain parts of speech but DO include both a noun and a verb within them. 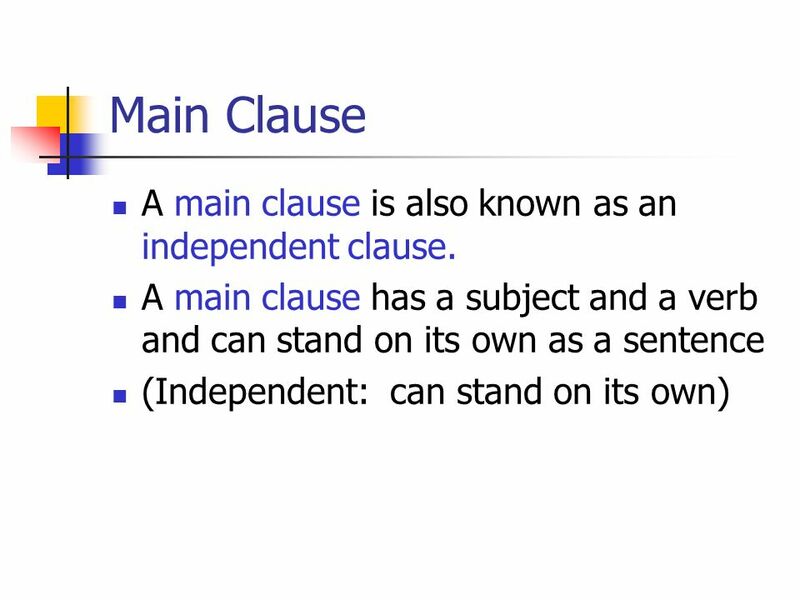 3 Main Clause A main clause is also known as an independent clause. 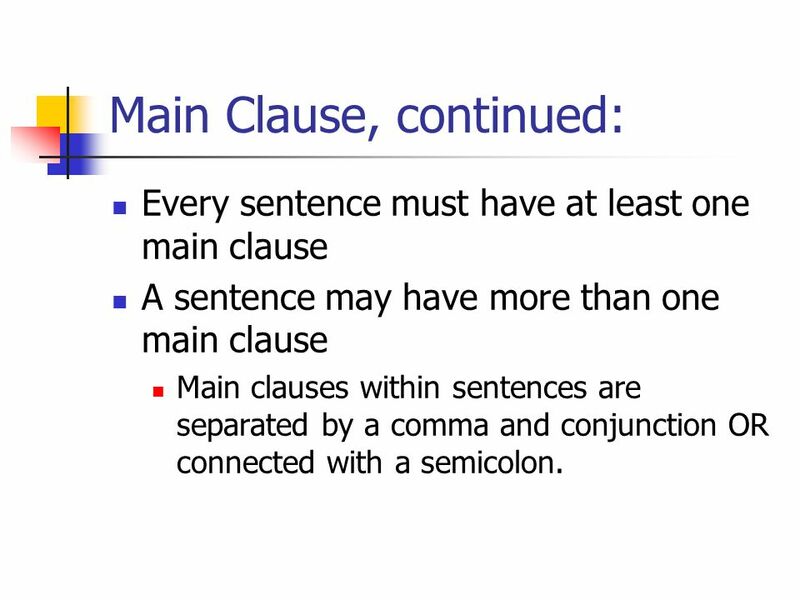 Every sentence must have at least one main clause A sentence may have more than one main clause Main clauses within sentences are separated by a comma and conjunction OR connected with a semicolon. My sister runs track, and I play basketball. 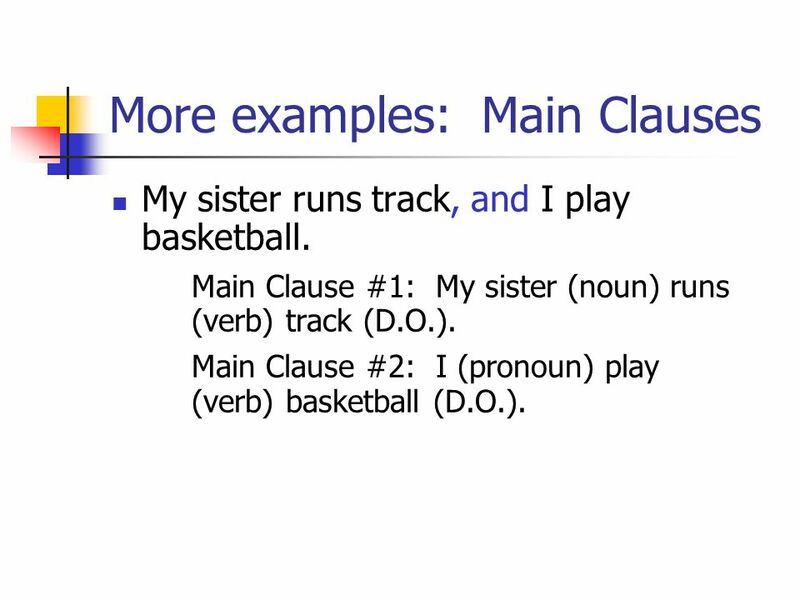 Main Clause #1: My sister (noun) runs (verb) track (D.O.). 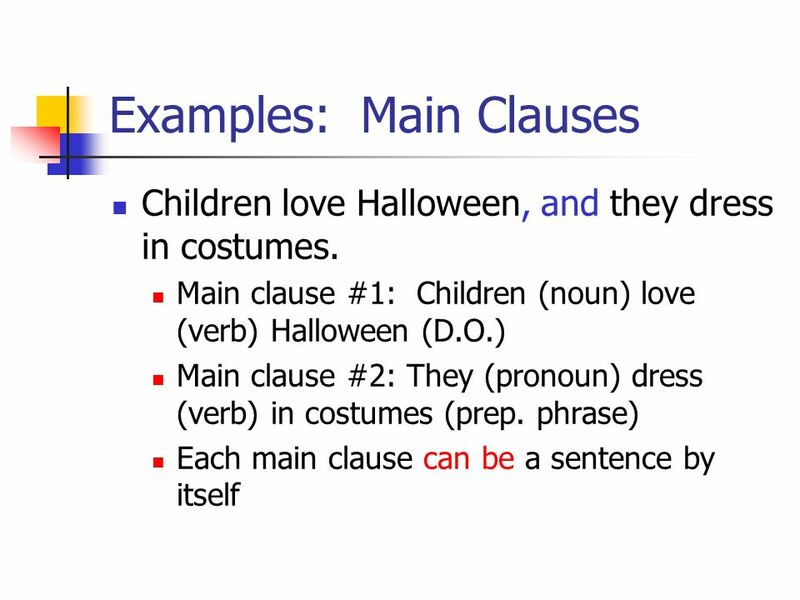 Main Clause #2: I (pronoun) play (verb) basketball (D.O.). 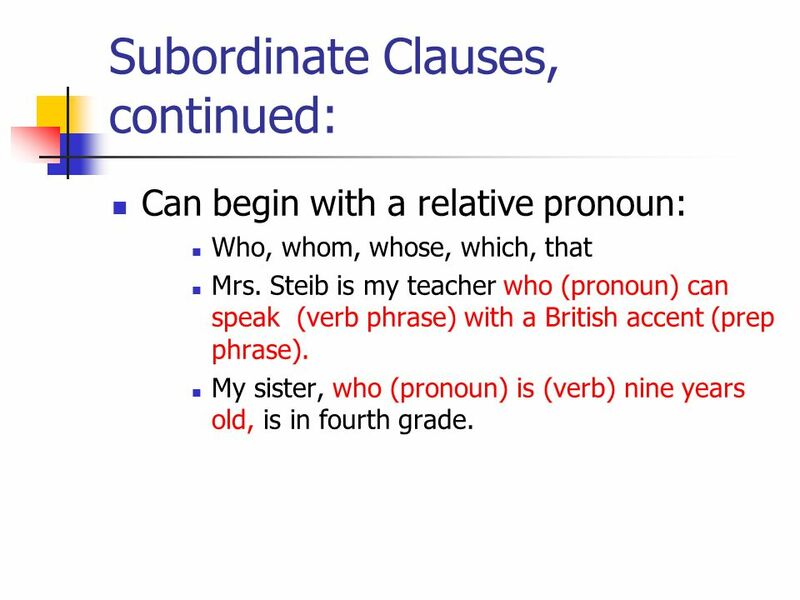 Can begin with a relative pronoun: Who, whom, whose, which, that Mrs. Steib is my teacher who (pronoun) can speak (verb phrase) with a British accent (prep phrase). My sister, who (pronoun) is (verb) nine years old, is in fourth grade. 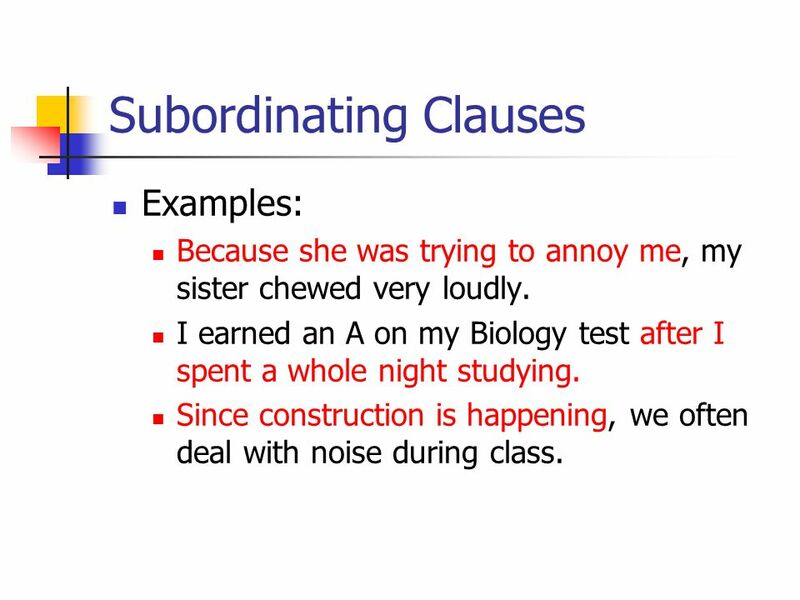 Examples: Because she was trying to annoy me, my sister chewed very loudly. I earned an A on my Biology test after I spent a whole night studying. Since construction is happening, we often deal with noise during class. 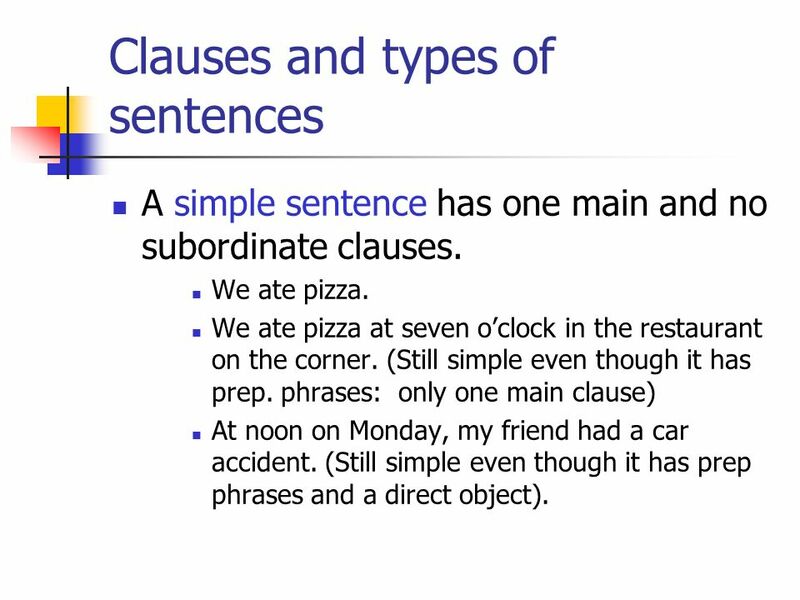 A simple sentence has one main and no subordinate clauses. We ate pizza. We ate pizza at seven o’clock in the restaurant on the corner. (Still simple even though it has prep. phrases: only one main clause) At noon on Monday, my friend had a car accident. 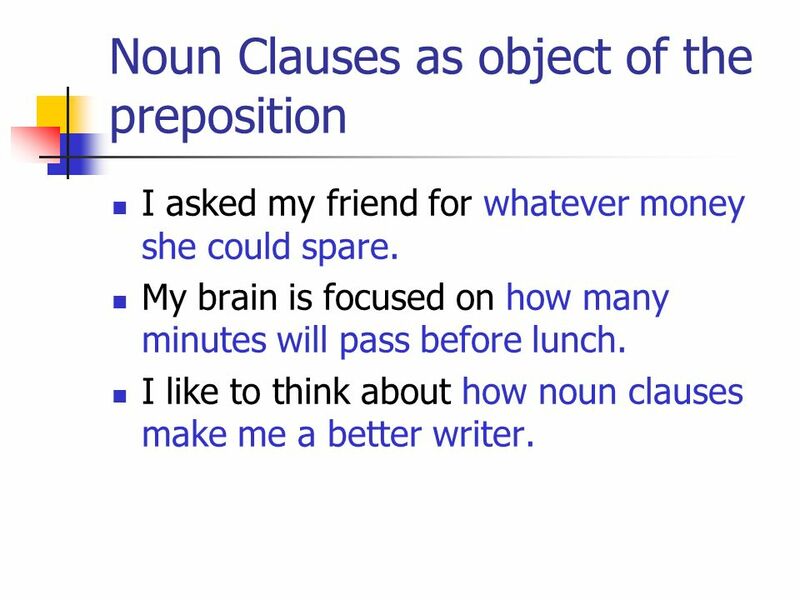 (Still simple even though it has prep phrases and a direct object). 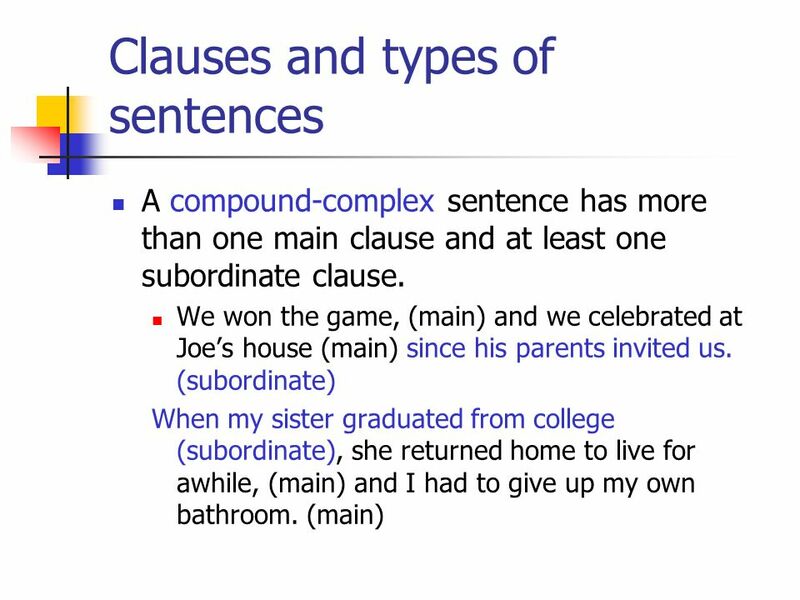 A compound sentence has more than one main clause and no subordinate clauses. 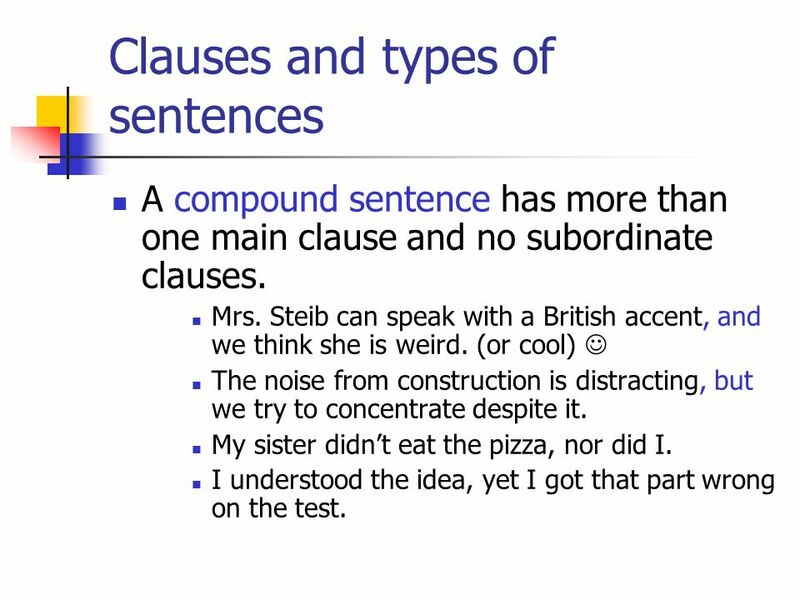 Mrs. Steib can speak with a British accent, and we think she is weird. (or cool)  The noise from construction is distracting, but we try to concentrate despite it. My sister didn’t eat the pizza, nor did I. I understood the idea, yet I got that part wrong on the test. 3 simple sentences. Label noun and verb. 3 compound sentences. 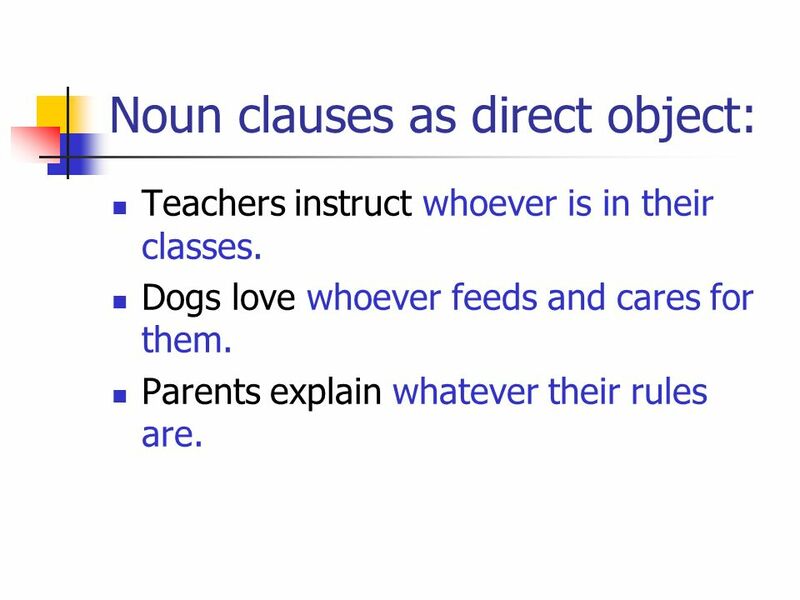 Label noun and verb in each clause. Punctuate appropriately! 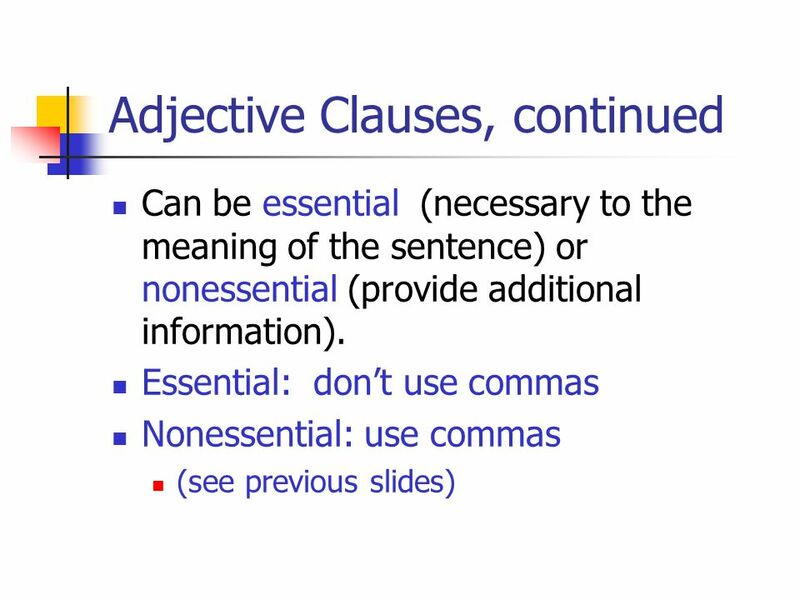 (Comma with conjunction OR semicolon) Save room on your paper! You will be adding sentences to this. Pair up with a classmate to check each other’s sentences. 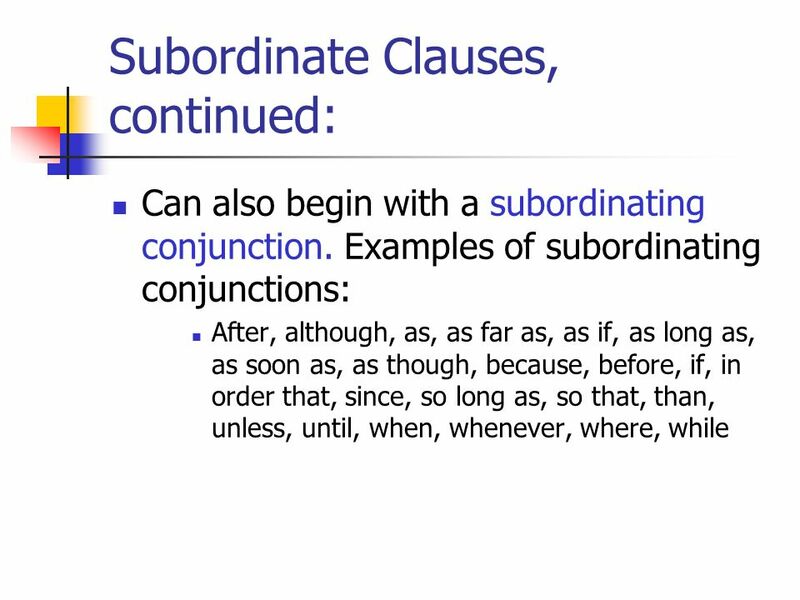 Simple: Only one main clause; no subordinate clauses Compound: More than one main clause; no subordinate clauses Complex: One main clause and one or more subordinate clauses Compound-complex: More than one main clause and at least one subordinate clause. 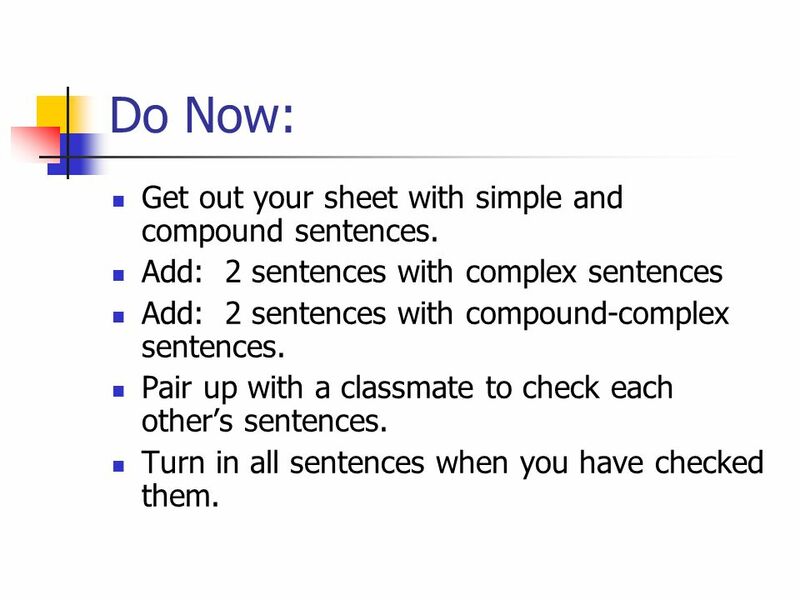 17 Do Now: Get out your sheet with simple and compound sentences. 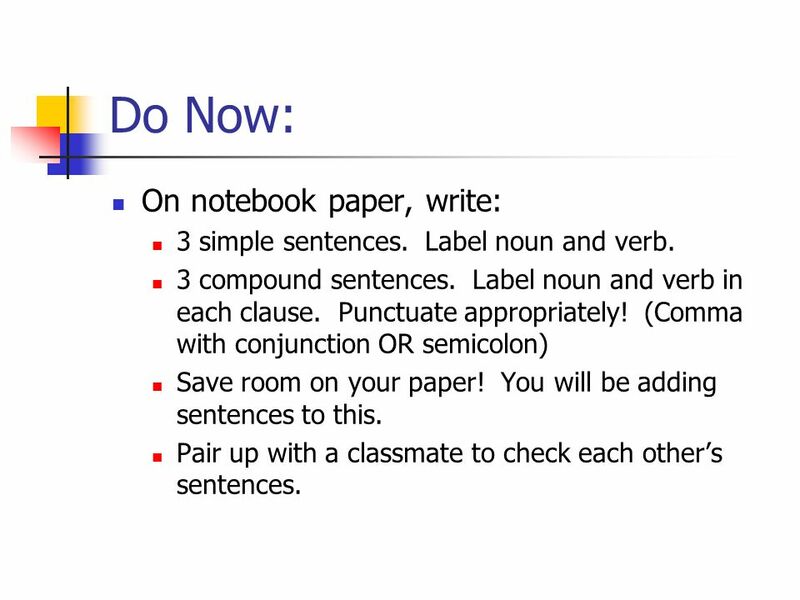 Add: 2 sentences with complex sentences Add: 2 sentences with compound-complex sentences. Pair up with a classmate to check each other’s sentences. 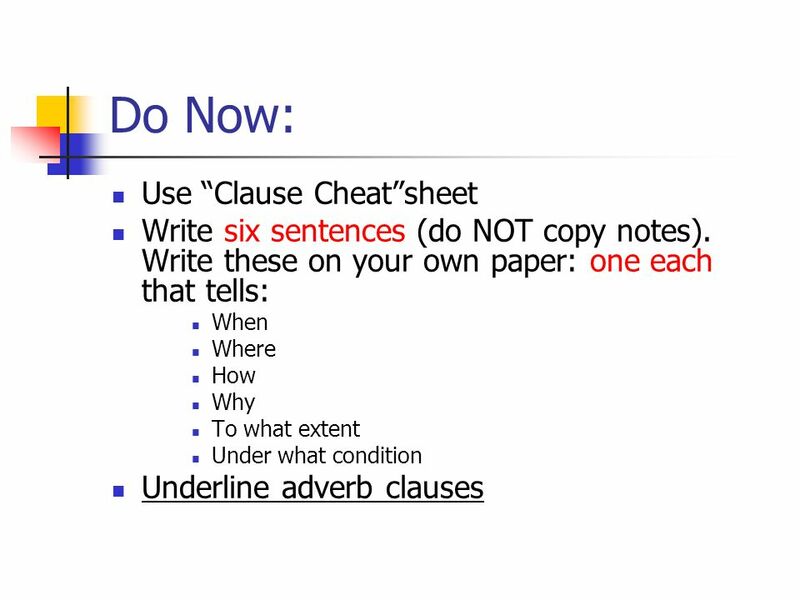 Turn in all sentences when you have checked them. Halloween decorations can be spooky. Halloween decorations are becoming more popular. 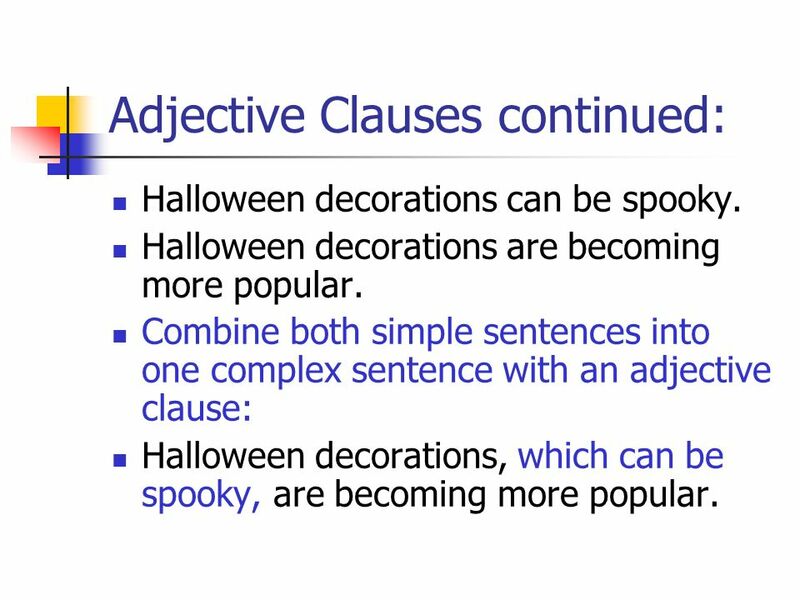 Combine both simple sentences into one complex sentence with an adjective clause: Halloween decorations, which can be spooky, are becoming more popular. I have a cold. This cold is a nuisance. I have a cold which is a nuisance. (subject: which; predicate: is) The one act plays are this weekend. The one act plays should be entertaining. The one act plays, which should be entertaining, are this weekend. Wherever he goes, my friend Tom draws attention. He draws attention because he has a very unique hairstyle with spikes and bright red highlights. 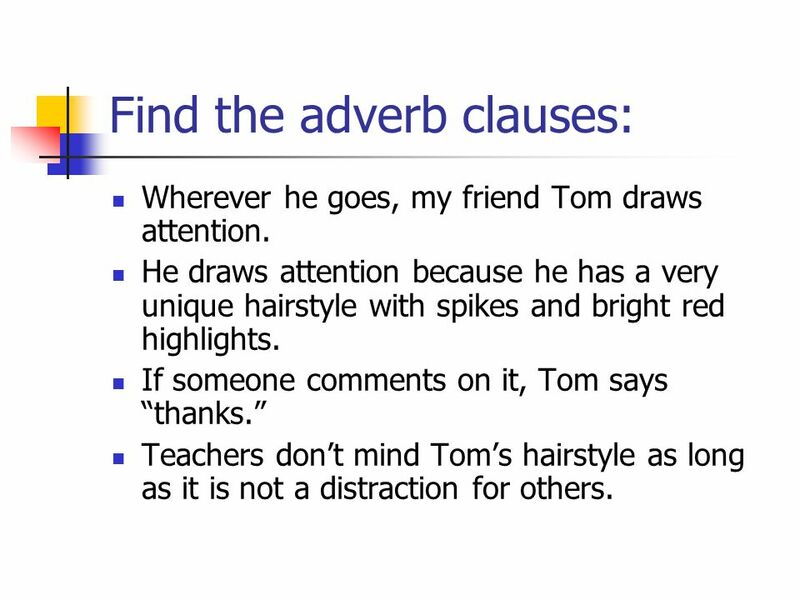 If someone comments on it, Tom says “thanks.” Teachers don’t mind Tom’s hairstyle as long as it is not a distraction for others. 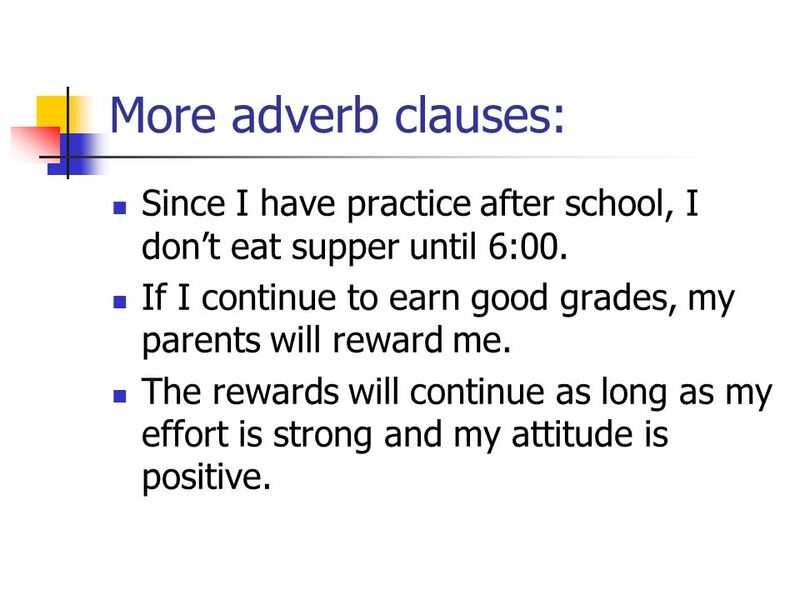 26 More adverb clauses: Since I have practice after school, I don’t eat supper until 6:00. If I continue to earn good grades, my parents will reward me. The rewards will continue as long as my effort is strong and my attitude is positive. Whoever wants to climb Mount Everest is adventurous. What makes mountain climbing exciting is that it is dangerous and demanding. Whatever happens during a climb can endanger the climber. What challenges climbers is the dangerous and exciting nature of the climb. Teachers instruct whoever is in their classes. Dogs love whoever feeds and cares for them. Parents explain whatever their rules are. I asked my friend for whatever money she could spare. My brain is focused on how many minutes will pass before lunch. 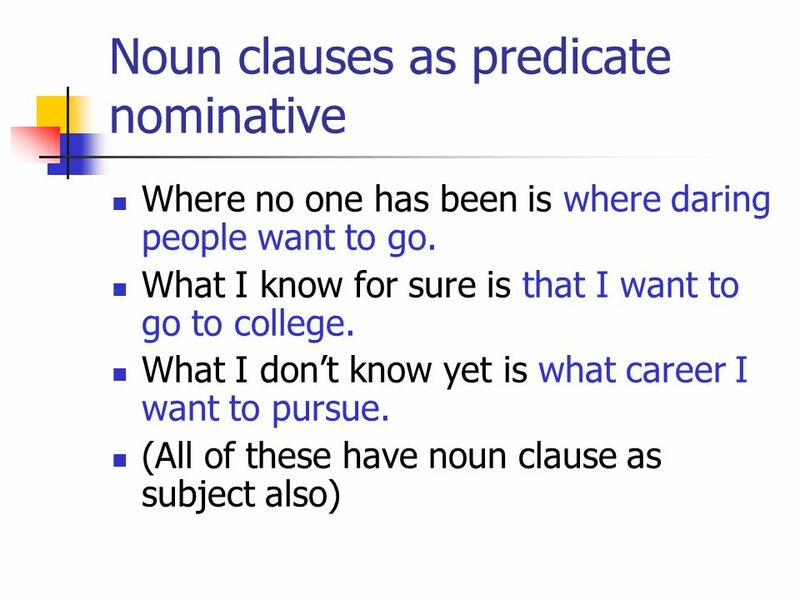 I like to think about how noun clauses make me a better writer. 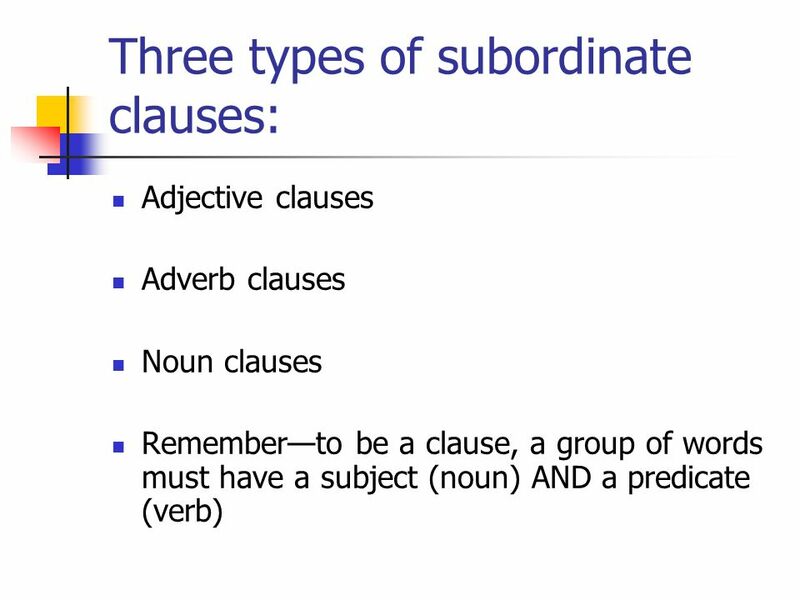 33 Noun clauses My sister can be annoying. 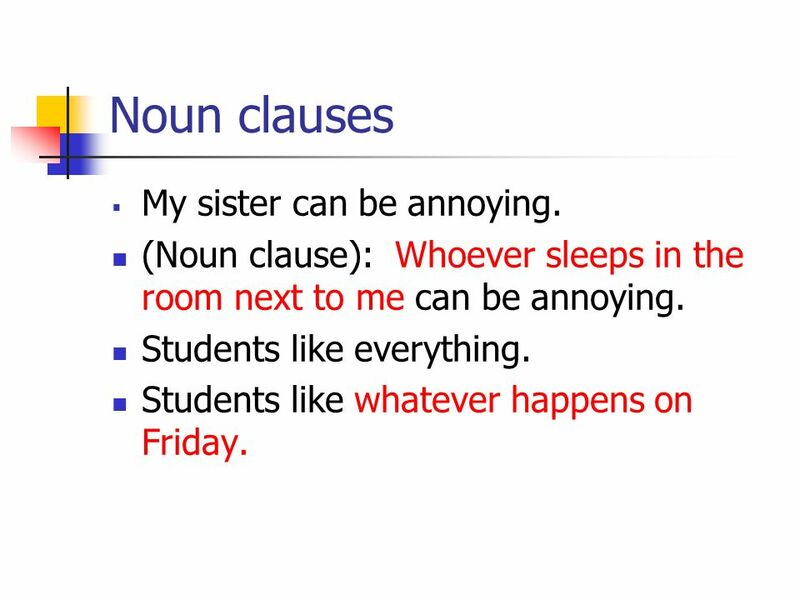 (Noun clause): Whoever sleeps in the room next to me can be annoying. Students like everything. Students like whatever happens on Friday. 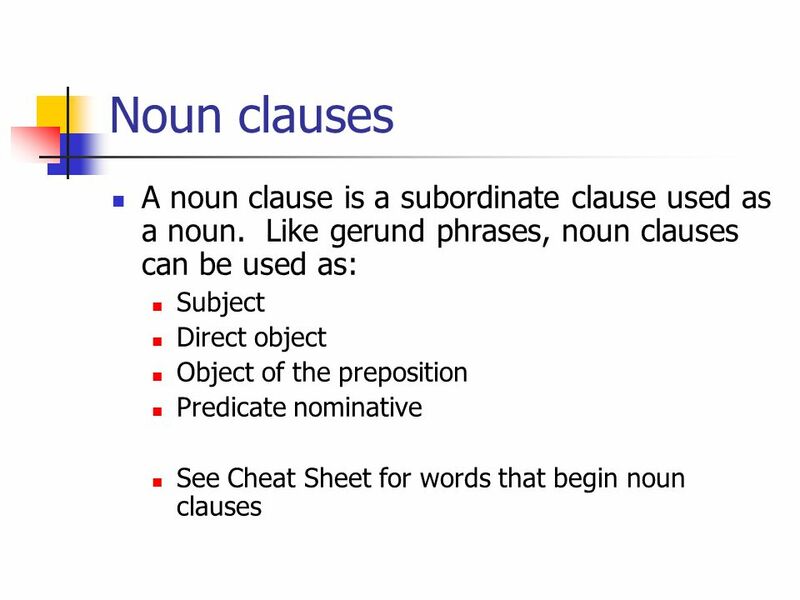 Download ppt "Clauses A clause is a group of words that contains a subject (noun) and a predicate (verb)"
Clauses Oops! 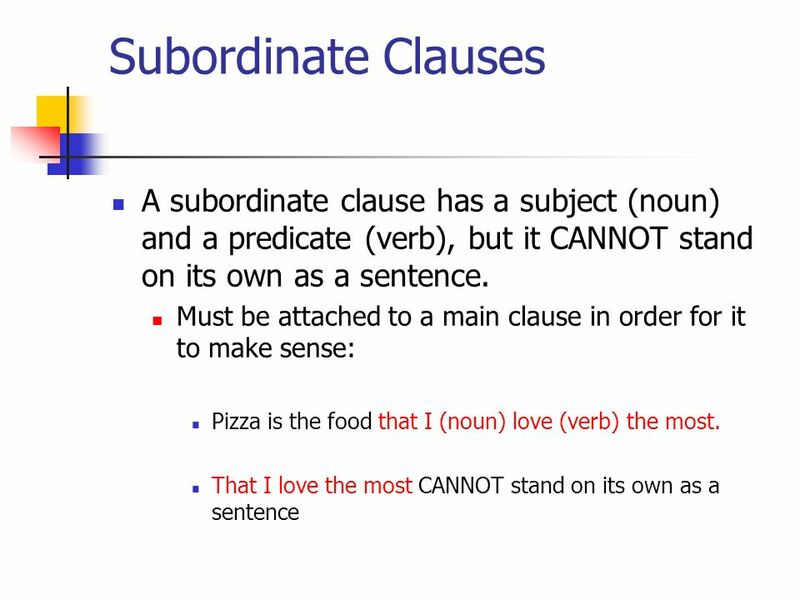 I think you have the wrong clause!. 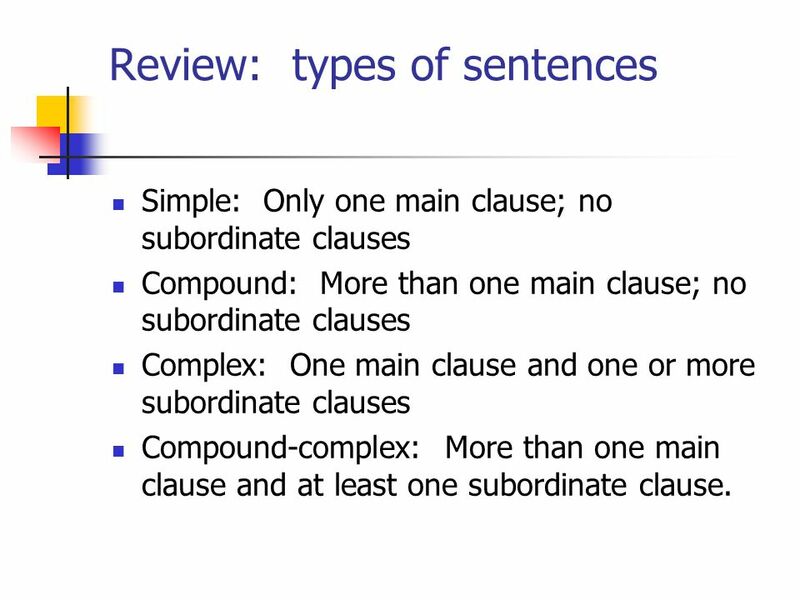 Grammar Rule: Kinds of Sentence Structure: Simple, Compound, Complex, and Compound-Complex Sentences Chapters 15 & 16 in Elements of Language Essential. 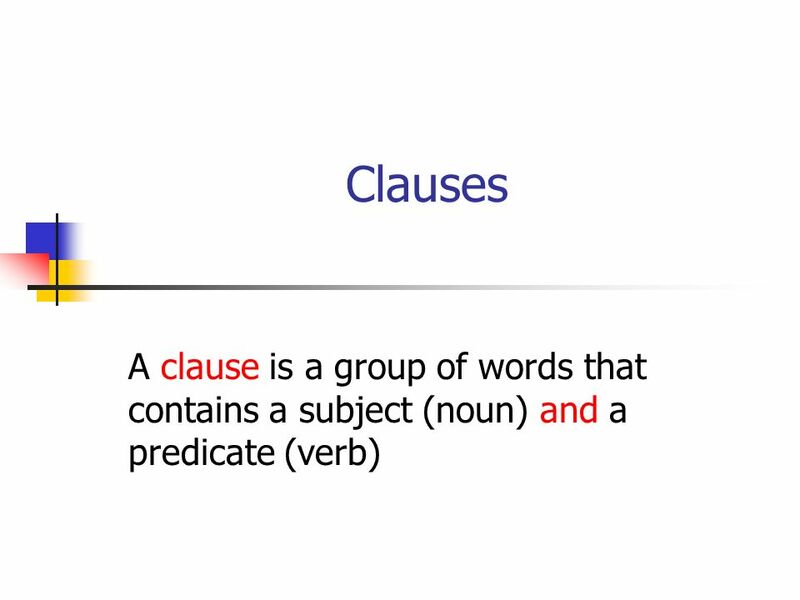 Clauses A CLAUSE, like a phrase, is a group of related words used together as part of a sentence. 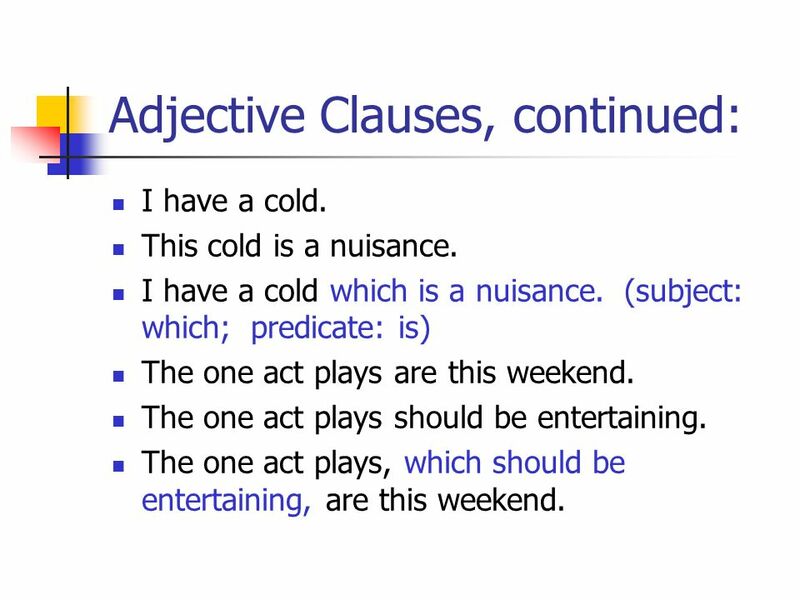 Clauses, however, contain a subject and verb, whereas. 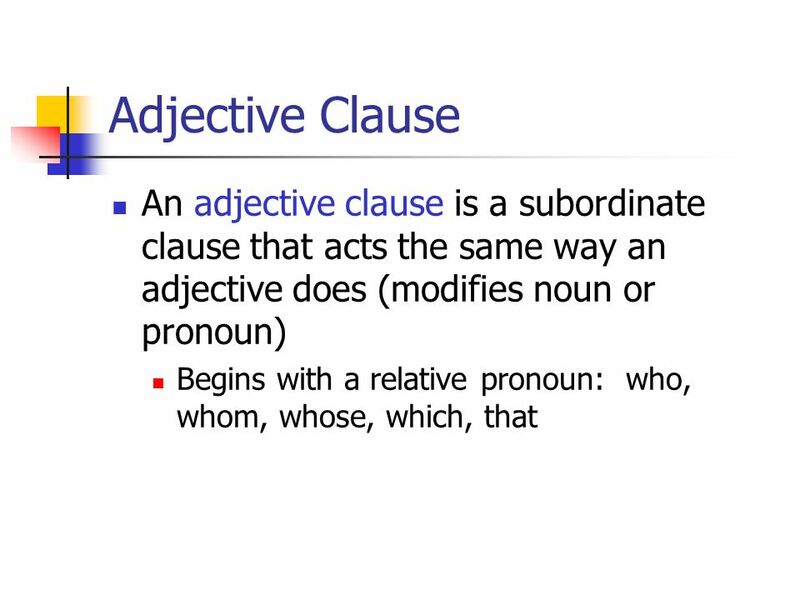 The Clause Mrs. Robilotto 9 CP. 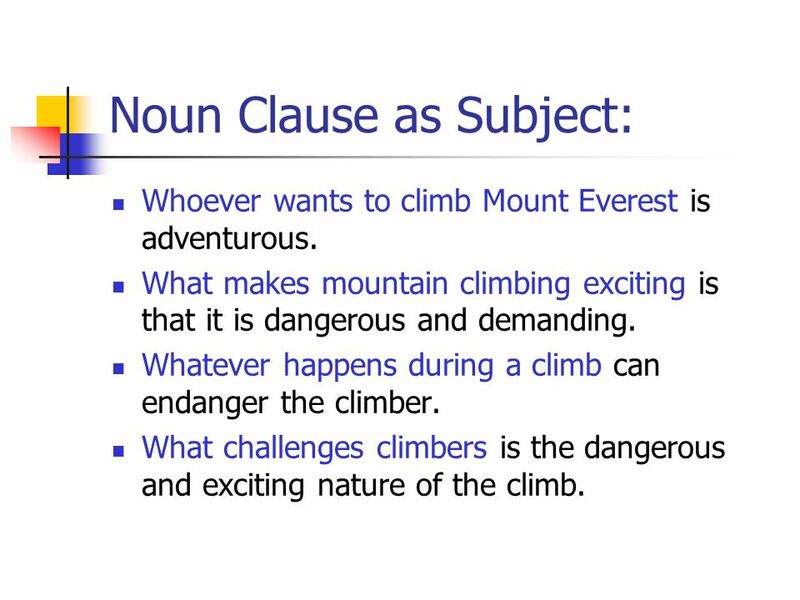 Definition THE CLAUSE A group of related words that is used as part of a sentence Contains a verb and its subject Can. Clauses, Independent, Dependent, Adjective, Adverb Mrs. Colley. Directions: Press F5 to begin the slide show. Press the enter key to view each part of the review.  A group of words that contains at least a simple subject and a simple predicate. 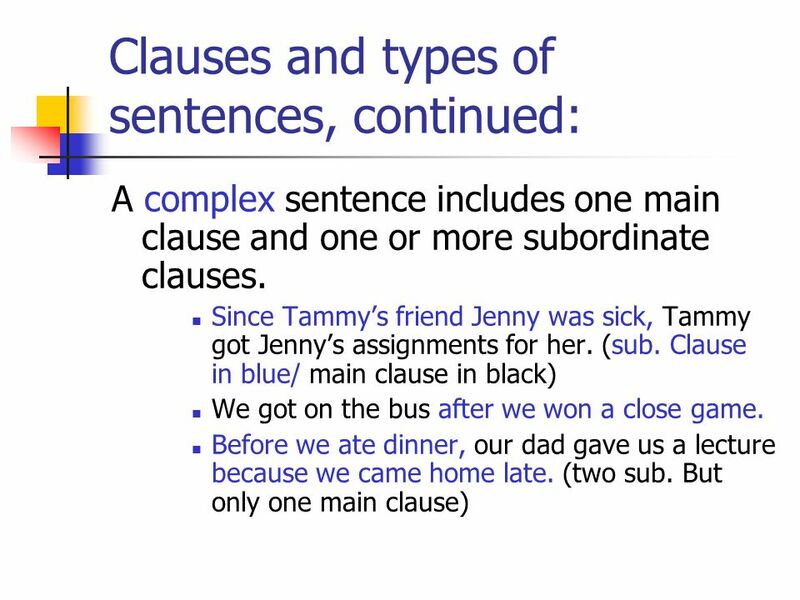  Two main types of clauses: ◦ Independent ◦ Dependent.